Purple has never been my favorite color. It makes me think of Elvis on velvet. 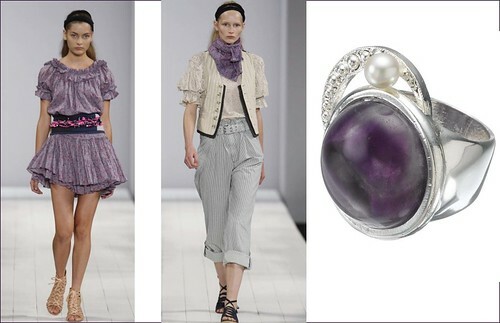 However, I’m loving Marc Jacobs’s lilac purple and Mad Baker‘s lavandar. They’re both dusty and lovely. Here’s a search for “purple” on shopbop. I love sites that let you search by color. Remember this post with some pictures from the Dior/Galliano show? I love that purple too. Here’s Joy’s post on Oh Joy about a lovely purple print by Yumiyumi on etsy. Here’s the Spring Pantone color report via Anmutig blog. Are you starting to think about Halloween costumes? sure thing Dallas. I have you on my reader so I don’t get to see the “look” of your site. Checking it out now! Thanks gf, you’re the best. oh I know…I can almost smell lilacs when I look at Marc Jacobs’s dress in the first pic. I just adore macarons. Thanks Abbey, I love it too….that purple would look good on us…..you know with the fair skin….